Congratulations to Jejoong Yoo and Hajin Kim on their Nature Comm paper sequence-dependent attraction between dsDNA! This work is a collaborative effort with U. Illinois CPLC collabrator Alek Aksimentiev. Dr. Yoo used the Blue Waters Supercomputer at the National Center for Supercomputing Applications on the Illinois campus to carry out detailed simulations of two DNA molecules interacting in a charged solution like DNA would encounter in a living cell. 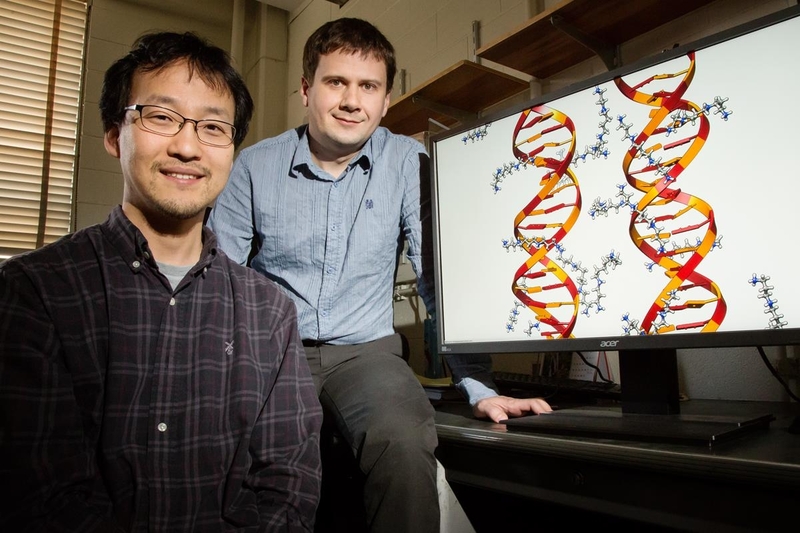 They predicted a sequence-dependence in the strength of DNA attraction, which was confirmed by single molecule fluorescence experiments performed by Dr. Kim. Although proteins mediate highly ordered DNA organization in vivo, theoretical studies suggest that homologous DNA duplexes can preferentially associate with one another even in the absence of proteins. Here we combine molecular dynamics simulations with single-molecule fluorescence resonance energy transfer experiments to examine the interactions between duplex DNA in the presence of spermine, a biological polycation. We find that AT-rich DNA duplexes associate more strongly than GC-rich duplexes, regardless of the sequence homology. Methyl groups of thymine acts as a steric block, relocating spermine from major grooves to interhelical regions, thereby increasing DNA–DNA attraction. Indeed, methylation of cytosines makes attraction between GC-rich DNA as strong as that between AT-rich DNA. Recent genome-wide chromosome organization studies showed that remote contact frequencies are higher for AT-rich and methylated DNA, suggesting that direct DNA–DNA interactions that we report here may play a role in the chromosome organization and gene regulation.